Herewith a very short update. I was very glad to be part of Test Automation Day 2013 with my track on “Structured Functional Automated Web Service Testing”. I was even more pleased to be introduced by Dorothy Graham. 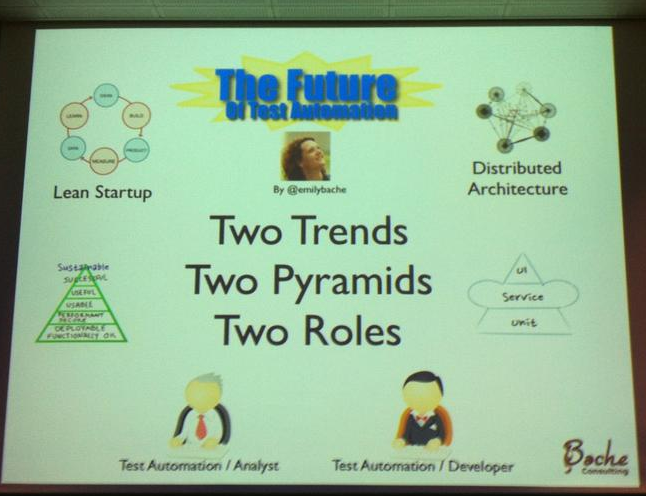 I really liked the final keynote by Emily Bache (@emilybache) with her vision on “The Future of Test Automation”. This was a very inspiring talk! She spotted two trends in our industry. The first one has to do with Lean Startup, a method for developing successful products. The second trend is towards distributed architecture, independently deployable components communicating via messages. Below you will find a quick summary photo of the keynote. 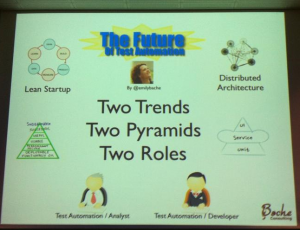 I’m looking forward to the next Test Automation Day edition!